The owner of the Yarraville Gardens land in Melbourne has announced that they plan to sell the land for residential use. 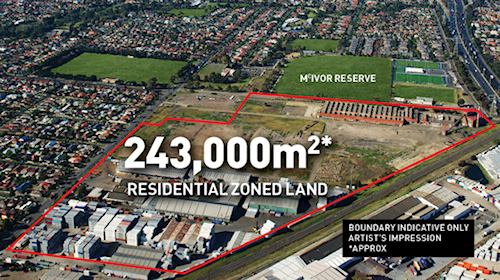 Currently home to Bradmill fabric manufacturing company, the 24 hectare site has already been approved for a residential land redevelopment that would contain up to 1500 townhouses and apartment buildings. Located only 6km from the CBD, redevelopment plans are also set to include a 10,000 sq metre neighbourhood shopping centre, a library and 400 car parks. According to CBRE director Mark Wizel, a commercial real estate services firm, the site is “expected to generate significant interest from the domestic private and institutional development market”, and is likely to attract attention from overseas. Wizel, who himself specialises in providing advice to real estate owners about the best way to position assets for sale and make sure that an asset appeals to the widest possible group of potential buyers, says that “There is little doubt that, while off-shore Asian developers are the most active buying group for large inner city sites with residential potential, Yarraville Gardens is expected to generate significant interest from the domestic private and institutional development market”. Recently, Melbourne has seen developers from Malaysia and Singapore take and interest in the CBD and city fringe, and it seems they looking to turn their attention to townhouse and apartment projects. Colin DeLutis of De Group, the current owner of Yarraville Gardens agrees, with Wizel that both private and institutional interest in the site is strong. “We’ve been approached many times over the past five years, and we think now is the right time for a formal sale campaign. “Whilst several attractive approaches have been tabled in recent years, we just didn’t feel the time was right, nor was the site ready due to the need for a zoning change and an initial, smaller scale development approval, which no doubt the successful buyer will look to improve upon,” says DeLutis. DeLutis claims that both Coles and Woolworths are possible tenants for the shopping centre. While this is still yet to be confirmed, he says that his company plan to develop a shopping centre on the business zoned section of the land, and are likely to retain ownership of the centre. This pending sale of follows a run of other monumental Melbourne sales, such as the Amcor paper mill in Alphington which sold for a record $120 million earlier this month, the former Age site in the CBD which sold for $75 million and Nigel Satterley’s $100 million acquisition of a major parcel of land in Point Cook.